Marvel Comics and Lucasfilm publishing have announced a new upcoming one shot comic book prequel to Rogue One: A Star Wars Story. 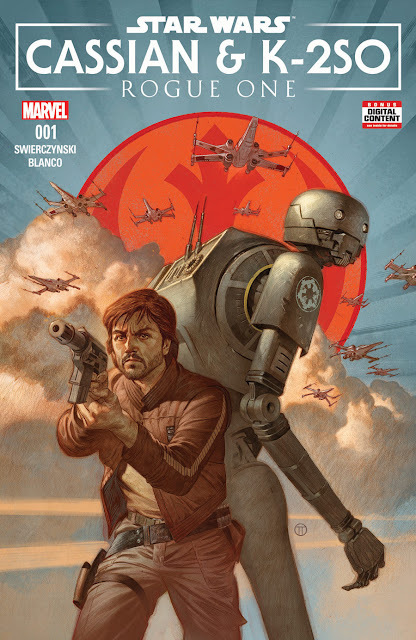 The comic, which hits shelves in August, will reveal how rebel intelligence officer Cassian Andor (played by Diego Luna in the film) and the reprogrammed imperial droid K-2SO (Alan Tudyk) first met. Star Wars: Rogue One — Cassian & K-2SO Special #1 is written by Duane Swierczynski with art by Fernando Blanco. StarWars.com also released the cover for the comic, which is drawn by Julian Totino Tedesco. Hopefully this is just the first in a long line of comics about the cast of Rogue One. There's so much potential for great stories with characters like Chirrut, Baze, Saw, Jyn, Bodhi, and Krennic, that it would be a waste not to explore them more in books and comics.